We’d love your help. 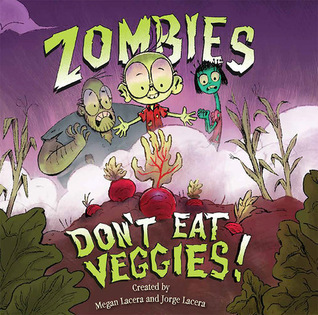 Let us know what’s wrong with this preview of Zombies Don't Eat Veggies! by Jorge Lacera. Mo Romero is a zombie who loves nothing more than growing, cooking, and eating vegetables. Tomatoes? Tantalizing. Peppers? Pure perfection! The problem? Mo's parents insist that their niño eat only zombie cuisine, like arm-panadas and finger foods. They tell Mo over and over that zombies don't eat veggies. But Mo can't imagine a lifetime of just eating zombie food and givi Mo Romero is a zombie who loves nothing more than growing, cooking, and eating vegetables. Tomatoes? Tantalizing. Peppers? Pure perfection! The problem? Mo's parents insist that their niño eat only zombie cuisine, like arm-panadas and finger foods. They tell Mo over and over that zombies don't eat veggies. But Mo can't imagine a lifetime of just eating zombie food and giving up his veggies. As he questions his own zombie identity, Mo tries his best to convince his parents to give peas a chance. To ask other readers questions about Zombies Don't Eat Veggies!, please sign up. Be the first to ask a question about Zombies Don't Eat Veggies! There are so many reasons to love this book. Megan and Jorge Lacera have such a fabulous sense of humor, accessible to both kids and their parents. I love the bilingual element, the “it’s okay to be different” element, the zombie family dynamic, etc. A fresh book that hits so many notes. 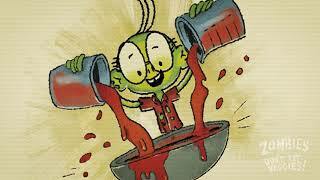 With zombies as hot as they are today, this is a welcome addition to humorous stories for kids. Mo Romero is not like other zombie boys. He does not like zombie foods like "brains", "man-naise", "Dori-toes", or "Chili con ojos". Instead, he would rather a delicioso meal of celery, tomatoes and carrots. Horrors! His parents just don't understand his taste buds, however they come to accept him as he is because they are more than zombies -- they are a family. Told using very yummy words like "tantal With zombies as hot as they are today, this is a welcome addition to humorous stories for kids. Told using very yummy words like "tantalizing" and "brain-eating competitions", phrases like "Holy Aioli! ", and puns found on foods and headstones ("Sarah Bellum" and "Juan Moortime"), the text by Megan and Jorge Lacera is a delight to read aloud. Sprinkled with Spanish, this is the kind of story that will tickle a kid's funny bone. Digital illustrations by Jorge Lacera are rich, lush, and full of good gory detail -- from the wallpaper in the house to the paintings on the walls to the food on the table. The family, shown in shades of green, are cartoonish in style and featured in many different sight gags. Kids may very well belly laugh at the reaction to his parents as they eat Mo's bisque. Although this topic (being a picky eater) has been covered in other books such as Gregory the Terrible Eater by Mitchell Sharmat (Four Winds Press, c1980), this story offers a fresh spin by adding fun recipes like "Blood Bile Bisque", "Zombie Finger Foods", and "The Romero Family's Famous Shockamole", interweaving Spanish in the text, updating artwork using digital techniques, and featuring a family of zombies (which adds an "ick" factor that kids gravitate toward). However, don't hold this back for Halloween or to use in a unit about food. This charming story can also be used to demonstrate acceptance and celebration of diversity: "Different doesn't mean bad, different just means different -- we love you just the same." This book is being published simultaneously in Spanish by Children's Book Press/Lee & Low Books. This book is utterly delightful! We received ZOMBIES DON'T EAT VEGGIES a few days ago, and my son has chosen it as his bedtime book every night since. And we both love that it is a bilingual book! My son adores the illustrations, and laughs at the different 'cuisines' drawn in the book. I can't wait to see what the Laceras create next! Most creative, funny picture book I’ve read in ages!! My kids LOVE this book and it's one I love rereading to them nightly! Beautiful illustrations AND funny story. I also love the creative Zoombie food names sprinkled about with touches of Spanish! Well done!!!!! !